Vinyl flooring has been the most popular type of floor covering in America for over forty years, and there are several reasons why. With relatively low purchase, installation, and maintenance costs, vinyl is one of the most economic flooring types available. It is available in styles that replicate the look of real ceramic tile, natural stone, and wood, and it is also available in a nearly infinite number of other styles, colors, and patterns. It is moisture resistant, which makes it ideal for kitchens and bathrooms, and it provides a comfortable walking surface. 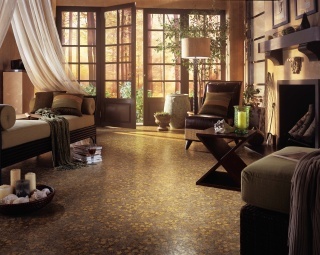 The more durable vinyl floors with thicker wear layers are factory warranted for up to 30 years.